Ringing in the New Year with the Thunder has been a tradition in Oklahoma City for a decade now, and so it stands to reason that regardless of the opponent, tonight’s “Opening Night” game is always one of the most highly anticipated of the year for Thunder fans. The mood is festive, the fans in Chesapeake Energy Arena are in great spirits and the Thunder itself is always fired up to play. In fact, the Thunder is 8-1 on New Year’s Eve games in the team’s history, with all 10 games coming at home. Despite the Thunder’s history, it’ll be a challenging matchup against a Mavericks team that beat the Thunder earlier this season and is coming off a performance where it beat the New Orleans Pelicans with 22 made three-pointers on 39 attempts. With a playmaker in Dennis Smith Jr. in the starting lineup, and point guards JJ Barea, Devin Harris and Yogi Ferrell coming off the bench, the Mavericks are stocked with players who can get into the paint and then dish for layups or open threes. The key for Head Coach Billy Donovan’s group is to get the ball corralled up at the three-point line. The task becomes even harder with the team’s best wing stoppers, Andre Roberson and Paul George, currently listed as out for this contest, as both are battling knee issues. Roberson left the game in the final seconds against the Milwaukee Bucks on Friday, and the absence of George certainly took its toll in the first quarter, when the Thunder struggled to find much of a groove. 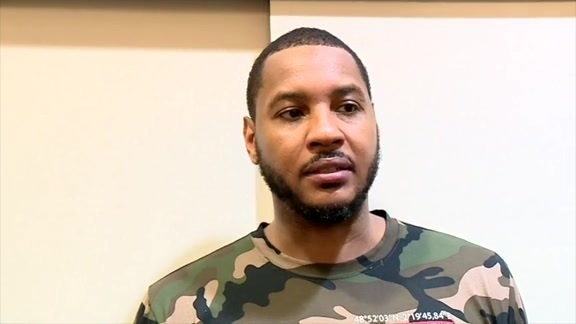 On the wing, veteran forward Carmelo Anthony picked up the slack as a defender, and it was clear that he’s the type of player who can diagnose the situation each night and then go out and try to provide what his team needs. Tonight against Dallas he’ll have to be able to keep Mavericks’ guards in front of him, while still taking advantage of scoring opportunities on the other end of the floor. The Thunder does have options who can step in and compete at a high level in the place of Roberson and George, if in fact they are unable to play tonight. Josh Huestis and Jerami Grant have performed admirably along the wing, and they’ll be counted on tonight. One player who Donovan wants to get going on both ends of the floor is Alex Abrines. The Thunder’s coach is committed to the belief that every player on the roster is important to team success, and needs to remain engaged in order for the whole team to succeed. The second-year Spanish sharpshooter has seen inconsistent minutes and provided up and down performances so far this year, which is understandable given the adjustment the entire team has had to make this season. If some extra minutes and a focused approach to being in the right spots on defense can get Abrines in a flow, that could make a world of difference for this Thunder group.